Jack Daniels. Oh wait….a round oak table. 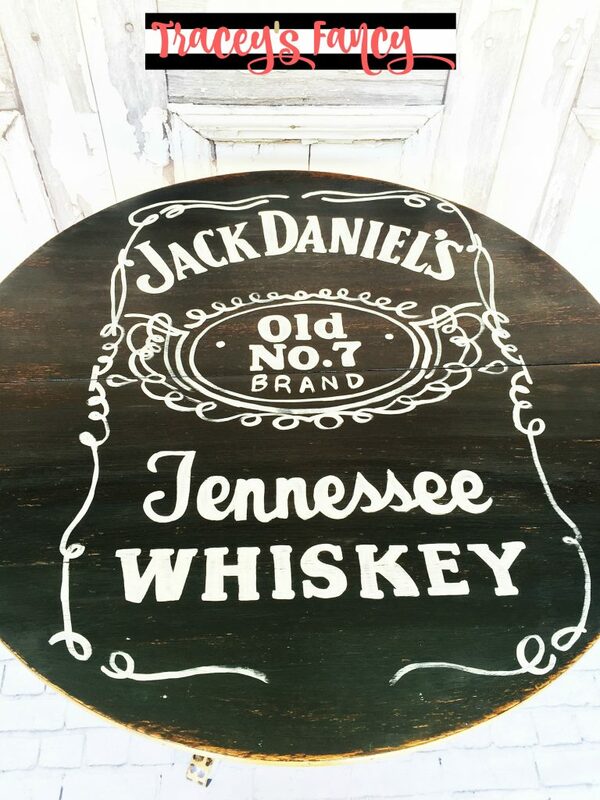 I have wanted to paint the Jack Daniels label onto a furniture surface for months! I wasn’t sure if it would be the front of a dresser or chest…..the top of a desk…..or a table…..but I knew it would present itself to me at some time. 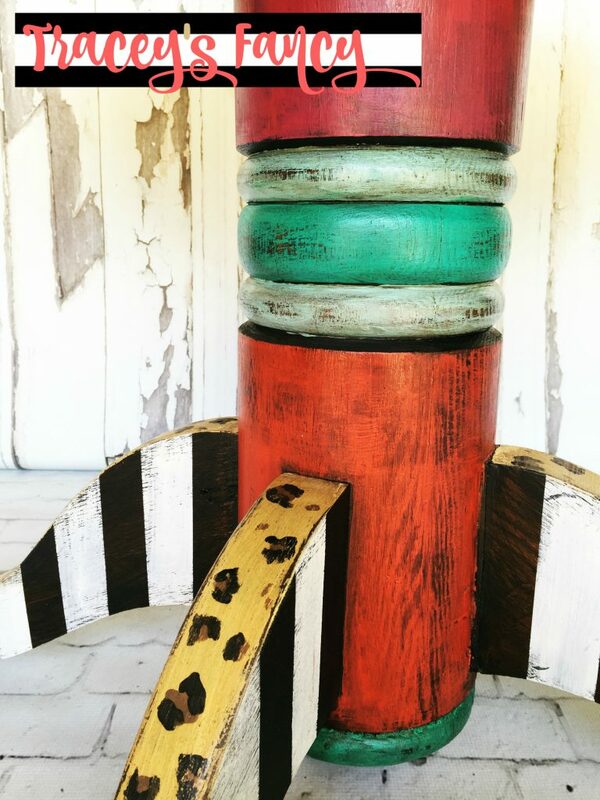 When Jamie from The Turquoise Door approached me about painting funky art furniture pieces for her fabulous boutique….I knew this was it! I lathered on my favorite black chalk paint….Caviar….by Dixie Belle Paint. I then projected an image of the label that I found on the internet onto the table top and traced it out with a piece of white chalk. I then cranked up my favorite honky tonk tunes and colored between the lines. Below is a short snippet of me painting this label by hand….. 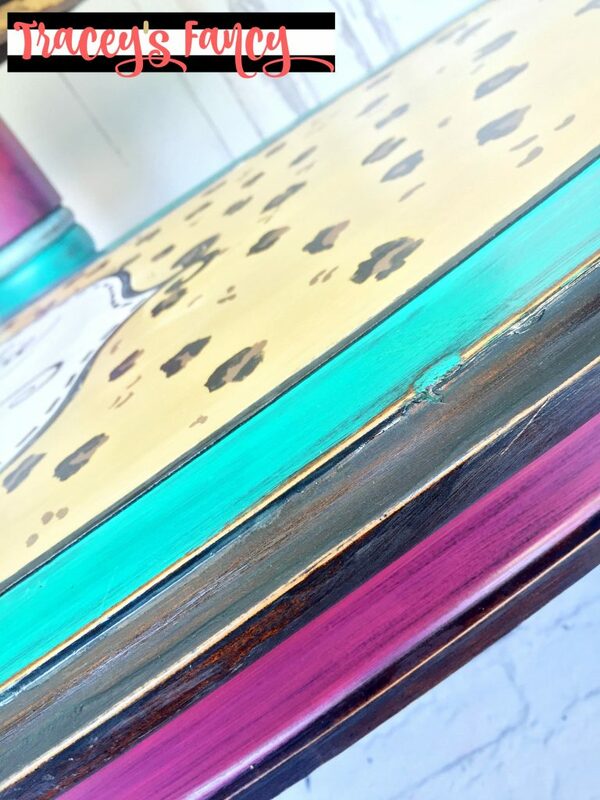 I covered the surface of the dainty yet detailed coffee table with a smaller version of my leopard print ….and trimmed it out with a gorgeous teal (Evergreen) and hot pink (Peony). I felt that both tables called for a heavy distressing. I knew this would allow the gorgeous natural wood to peak through and offer a sense of rawness. The rich red of Honky Tonk Red against the raw pattern of the wood grain on the table pedestal is sooooooo yum!!!! I had no choice but to frame it out with black and white stripes which always offer a beautiful back drop for a focal point! 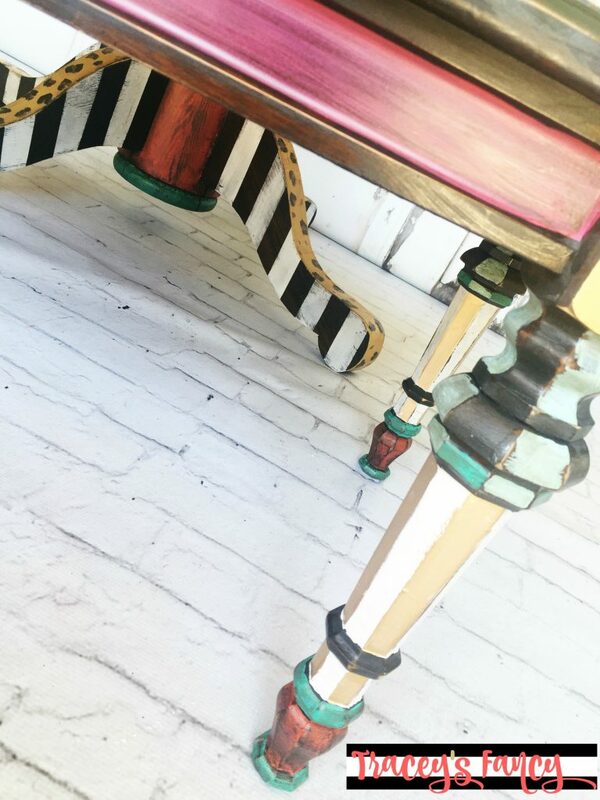 The “spindley” coffee table legs are adorned with metallic gold against white which plays off as stripes. 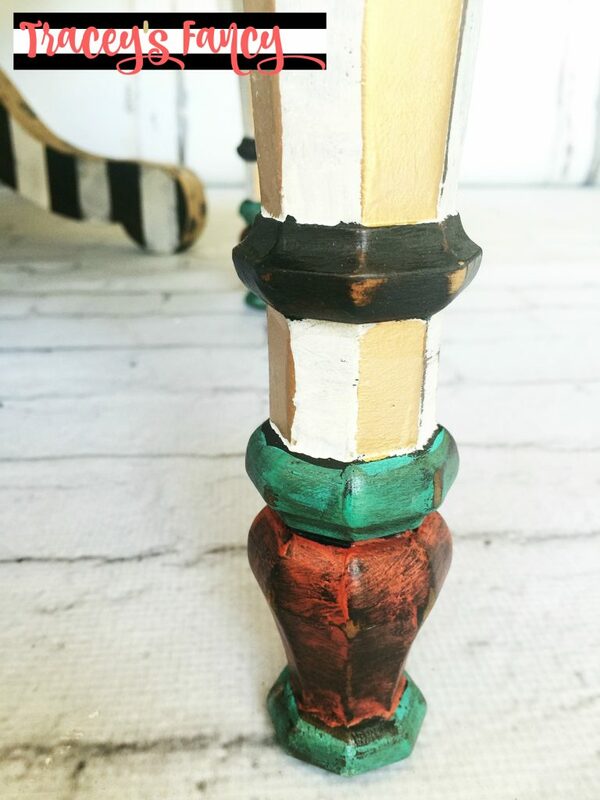 The heavy distressing and final glazing with Grunge Glaze knock back the color just enough to keep it from being honey…..and even make it a bit grungy. I had so much fun with both of these tables! 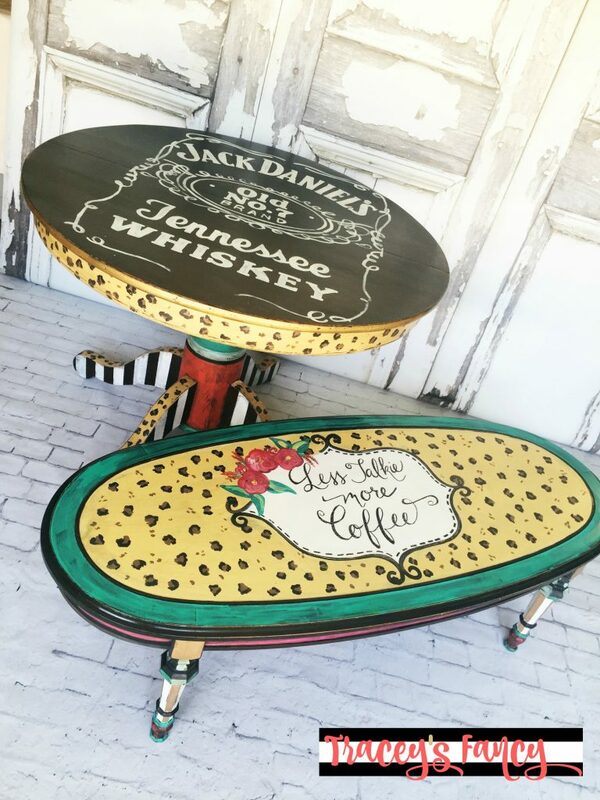 It is my hope that someone out there will find this funky art furniture as fun and fabulous as I do….and want them in their home to enjoy every day (and maybe a little Jack Daniels and Coffee too)! Dixie Belle Paint company offers amazing products that will make all of your projects successful no matter what your skill level! Here are the links to the products I used on this fun and funky piece! You can also my favorite products and tools in my Amazon influencer list here. 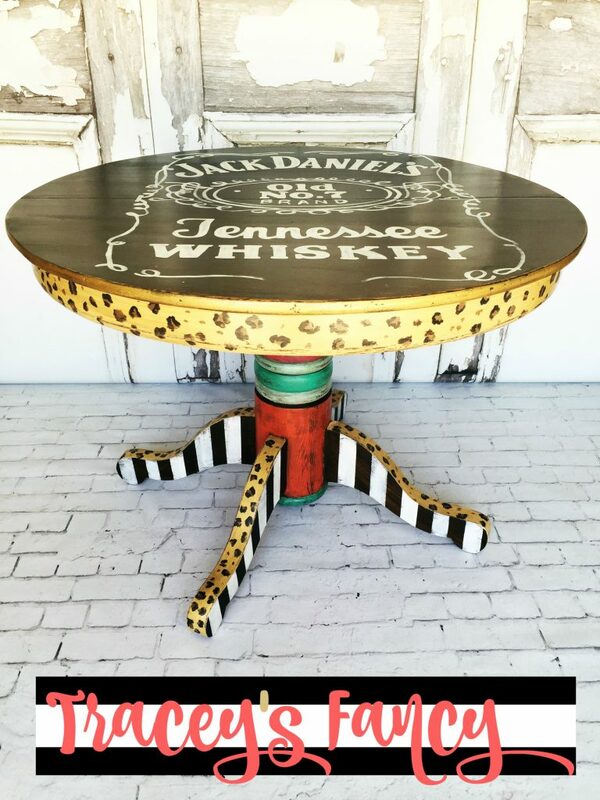 Please pin my Jack Daniels table and More Coffee coffee table! 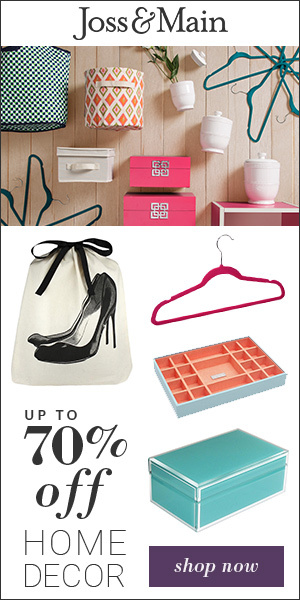 And don’t forget to follow me on Pinterest and sign up to get my emails here. As I linger over the photographs of these two pieces I’m transported…to a world where sassy fun and merry mischief are the highest expressions of the joy of life! Tracey, I try to really imagine the sense of excitement and accomplishment that must overtake you when you begin to see your vision take shape: what triumph you must feel! You really get it, don’t you? You understand the feeling one gets when actually seeing the vision…and then bringing it to life. Thank you Heather…and I also thank YOU for sharing your mulitude of talents! I don’t mean that lightly!!! Beautiful work, Tracey!! Love it all! You’re a rock star, my friend. Thank you Lori! And thanks for visiting my blog!! !